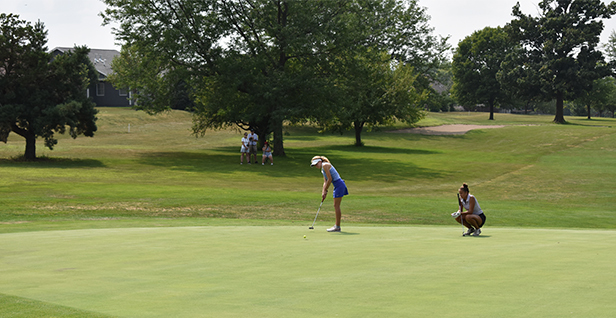 Pleasant Hill, Iowa – The first round of the Iowa PGA Junior Tour Championship was played today at the Copper Creek Golf Club. This Major Point event will conclude tomorrow, starting with a 1 p.m.
Tyler Sansgaard of Nevada, Iowa leads the Boys 16-18 age division after the first round. Sansgaard carded a 2-over-par 73 with two birdies. He currently holds a one-stroke lead over Nathan Ferrell who recorded a 3-over-par 74 today. Paige Hoffman and Jenna Krogulski share a tie for the lead in the Girls 16-18 age division after carding 3-over-par 74. Hoffman tallied five birdies, including three-in-a-row on Nos. 15-17. Krogulski registered two birdies in her first round. Anna Jensen and Bella Amador-Lacson are just one stroke off the lead heading into the final round. Cale Leonard is the Boys 14-15 age division leader following his 5-over-par 76 in round one. Leonard carded one birdie in the first round and 11 pars. Matthew Briggs trails Leonard by one-stroke heading into the final round. Rylee Heryford of Newton, Iowa sits atop the Girls 14-15 age division. Heryford carded a 5-over-par 76 in the first round and holds a one-stroke lead over Kylie Carey. Camden O’Malley and Brady Blake are tied for first place in the Boys 12-13 age division. O’Malley recorded a bogey-free back nine with two birdies. He added another birdie on the first hole, giving him three in the first round. Blake tallied one birdie in the first round. The two are tied at 7-over-par 78. Rebecca DeLong and Hallie Yates are tied for first at 7-over-par 42 in the Girls 13 & Under. Saleah Vivanh-Vong is one-stroke off the lead entering the final round. Lucas Laffoon of Johnston, Iowa leads the Boys 11 & Under age division following his 3-over-par 39 in the first round. Andrew Johannsen sits in second place, trailing Laffoon by two-strokes. The final round of the Iowa PGA Junior Tour Championship takes place tomorrow at 1 p.m. at the Copper Creek Golf Club. Click here to view round two pairings.